Why would an institution choose to build a homegrown system? And why would that answer be different for one specific product within the realm of higher education systems? Let's delve into that conundrum for a moment. So a need is established within the institution which the latter wishes to address. It is deemed essential enough to warrant spending a large amount of money. Then comes the evaluation phase of appraising the market options. Since the build vs. buy decision must be made early in the evaluation phase, the institution must decide whether a proprietary system would be more beneficial to their specific needs or an off-the-shelf product could be used and processes reevaluated along the way. The visualization below shows the trend of build vs. buy for higher education institutions. 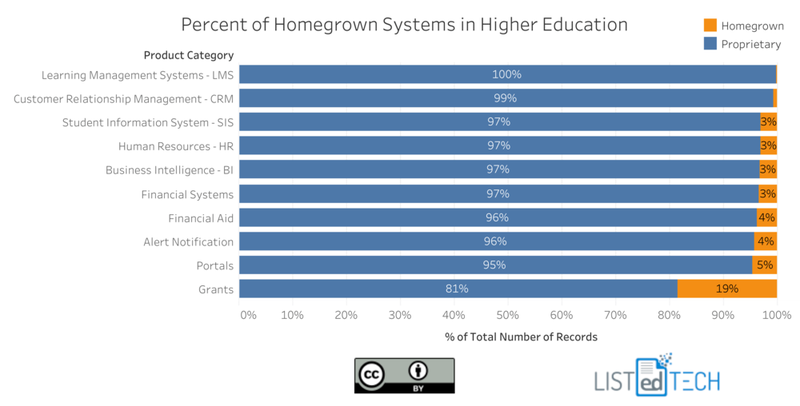 Most product categories have a 1 to 5% of institutions with a homegrown system, but look at the Grants product category; it shows that 19% of institutions have a homegrown system. Why is that? The answer leads us to more questions: are the current commercial systems not able to respond adequately to the institution's requirements? or is it that a grant system is simply easier to build in-house with the exact institution specifications installed? Let me know what you think? Any theories worth considering?